Last August, I wrote about the exciting work of usability expert Dana Chisnell and several colleagues on a series of Field Guides for Ensuring Voter Intent, which Humphrey’s Election Academy is helping to promote with support from the John D. and Catherine T. MacArthur Foundation. 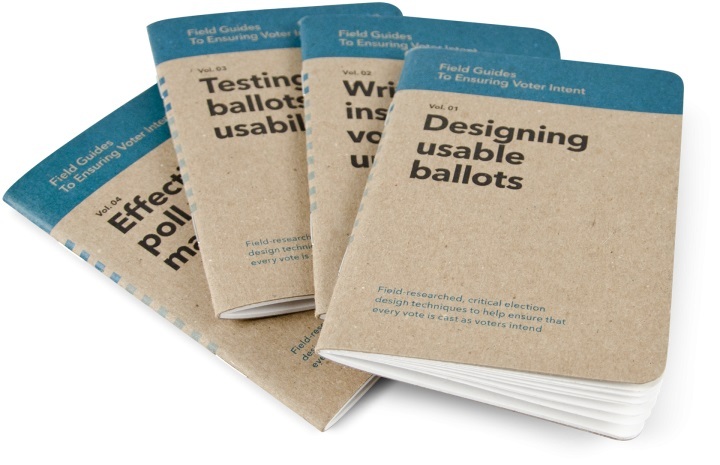 In less than a year, the Field Guides have been nothing less than a smashing success, gaining rave reviews for both their content and their ease of use for busy election professionals. Right now, the guides are available for free download, but you can pre-order printed copies through CivicDesigning here. Either way, you’ll be glad you did. Congratulations to Dana and the entire Field Guides team for their continued commitment and passion for this project! Be the first to comment on "The Hits Keep Coming – Four New Field Guides Now Available"